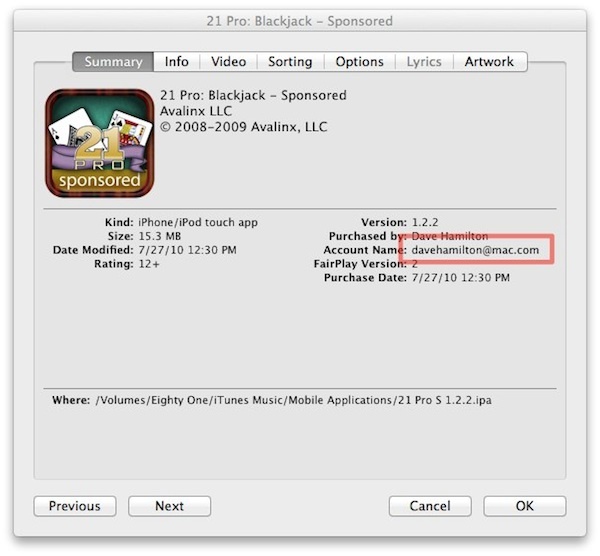 Adam writes: I’ve used a number of different Apple IDs over the years to purchase iOS apps. Now, I’m trying to update apps but I can’t remember which Apple ID is associated with each app. How can I find out which Apple ID I need to log in and update my apps? Locating the Apple ID associated with an iOS application is thankfully an easy process. First, launch iTunes on the computer that your apps are stored on. Navigate to the Apps section of iTunes and right-click on the app that needs to be updated. Choose “Get Info” to bring up the app’s information. Now, under the Summary tab, look where it says “Account Name.” The email address listed here will be the Apple ID that was used to purchase the app and is the Apple ID you’ll need to log in with in order to update the app.